Want an introduction to the trails at the Frederick Municipal Forest (a.k.a. The Watershed)? Well, two rides are set for June 5th which happens to be National Trails day, so come celebrate with a bike ride. One ride is a women's only, casual paced ride while the other ride is an open, moderate paced ride. 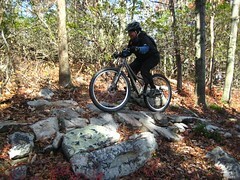 Don't be fooled, these aren't beginner rides as the terrain is fairly difficult. Full details below. Description: A good opportunity to improve your rock skills! This ride is for intermediate to advance riders. The pace wiill be casual with stops to regroup and work on some of the tough technical sections. Ride will last approximately 2 -3 hours. Ride Level: Pace: Moderate. Fitness: Moderate. Terrain: Technical. Description: Maybe you've wanted to ride the Frederick Watershed but the lack of blazed and signed trails and the thought of getting lost has kept you away. Or maybe you aren't sure if you are up to the technical challenge. If so, this it the ride for you. This is part II to the earlier ride I led at the end of April, we'll cover entirely new terrain than we did on that one. This loop will be 10 - 15 miles with a few options to bail. This is an introduction ride, but not a beginners ride. You'll need decent fitness and a few technical skills: getting over logs and being able to ride some gnarly rock. We'll probably stop a few times to play on the rocks if the group wants but otherwise will keep moving at a moderate pace. Questions about whether this ride is for you? Email me and ask!